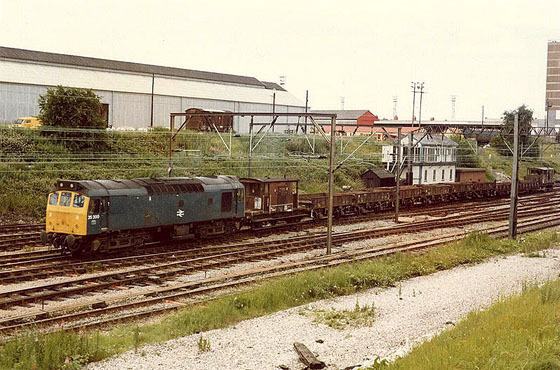 Photograph courtesy Steve Houlker Ladywell Sidings, Preston on Sunday July 21st 1985 with 25200, 47150 & 47069 awaiting their next turn of duty. The twenty year eight month career of D7550/25200 was entirely spent allocated to London Midland Region depots. Time between withdrawal and scrapping: 12 months (cabs lasted a little longer). October 1965 Nottingham Division (D16). 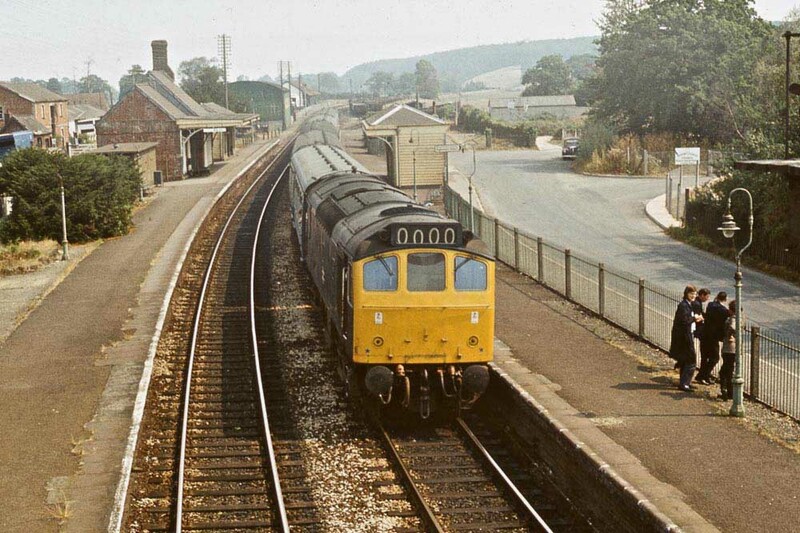 January 1975 to Carlisle Kingmoor (KD). 25200 was the 269th Class 25 to be withdrawn. 25200 was condemned whilst at Derby Works, it was later sold to Vic Berry, Leicester, on a snowy January 19th 1987 47199 took 45117, 45057 & 25200 (with snow still on their roofs) to Humberstone Road, Leicester, 25200 moved into Vic Berry's Yard on January 27th 1987. 25200 was broken up by the third week of February 1987, although the cabs lingered awhile longer. Noted Derby Works October - November 1974 (dual braking equipment fitted). Noted Derby Works December 1979 - January 1980 (Classified). Noted Derby Works December 1980 - January 1981 (N4 repairs). Noted Derby Works September 1982 - January 1983 (collision repairs). Noted Derby Works March 1984 (N6 repairs). Noted Derby Works December 1985 until withdrawn. D7550 was under construction at Derby between February & May. It was delivered during June to the Nottingham Division (M16), later transferred to the Leicester Division (D15) during October, and then back to the Nottingham Division (M16) later that same month. July to September were spent at Derby Works (collision repairs?). Condition April: two-tone green livery with full yellow ends, hand/footholds plated over, mixedstyle sandboxes, three-rung bogie mounted footsteps. On May 27th 7550 & 7563 were noted on a Derby - Yarmouth service as far as Norwich. 25200 was expected at Derby Works for a General Repair including the fitting of dual-braking equipment during the summer, however the locomotive did not enter the Works until October for these repairs. This summer reprieve allowed 25200 & 25209 to work a Derby - Skegness round trip on June 29th. On April 7th 25200 was in use in the lifting of the Ayre branch. Kingmoor’s 25200 arrived at Exeter on August 13th with the regular freight from Severn Tunnel Junction, the next day (14th) it was in use on passenger services over the Barnstaple branch! Photograph courtesy Peter Lovell Here is borrowed 25200 at Crediton on August 14th 1976 working the 13.40 Exeter - Barnstaple. On August 21st 25200 & 25202 worked the 08.40 Leicester - Skegness and the return 18.30 Skegness - Leicester. During August 25200 was active on the North Wales mainline on both 18th & 22nd working the 11.11 Manchester Victoria - Holyhead throughout. 25200 & 25247 worked August 11th's 10.15 Scarborough - Birmingham New Street. The failure of 86257 on November 3rd's 11.00 Euston - Birmingham New Street somewhere in the Coventry area found 25200 & 25039 coming to the rescue, taking the service into New Street. 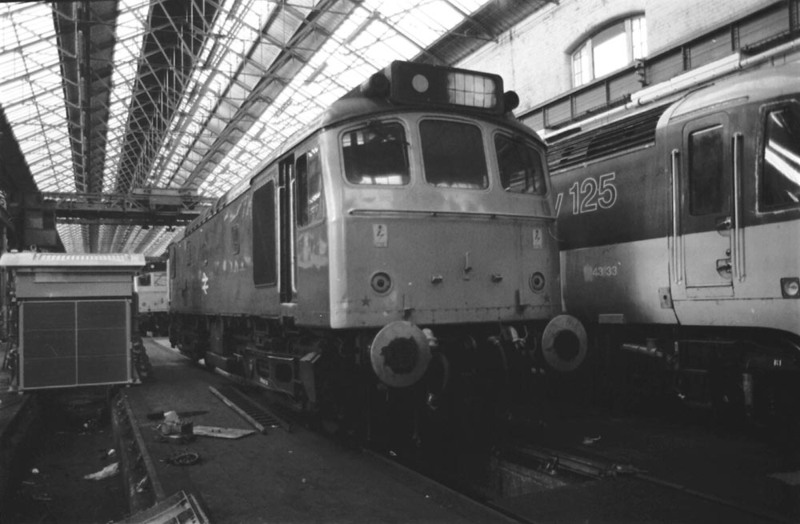 25200 was noted at Derby Works between December 1979 and January 1980 for a General Repair. April Fool's Day was a challenge for 47474 when it failed on an early morning Barrow - Preston service, 25200 was on hand to take the train on into Preston. A Leamington - Edinburgh charter on August 30th utilised 25200 & 25263 to and from Coventry. On November 11th 25200 & 25201 worked a four coach Royal Train with Prince Charles from ?? to Aberystwyth. The next day (12th) the same locomotives returned the empty stock to Wolverton. Both locomotives had been spruced up for the occasion, complete with silver buffers. 25200 visited Derby during December 1980 and January 1981 for N4 repairs. Photograph courtesy Barrie Watkins 25200 in No.8 Shop at Derby Works on January 24th 1981 undergoing N4 repairs. To the right is HST power car 43133. Two seaside visits were made by 25200 at the end of May & beginning of June. On May 30th it was off to Yarmouth (well at least to Norwich and back!) with 25182. The next day (May 31st) it was a round trip Leicester - Skegness, still with 25182. And finally on June 6th it was back on the Derby - Yarmouth service with 25215, however the Type 2s got no further than Nottingham where they were failed and replaced by 47334. On November 6th 25200 & 25201 worked the Leith South - Heysham Harbour pipe train. 25200 returned north with the empty flats, at least as far as Carlisle. At the beginning of the summer season 25200 made several trips over the Cambrian lines. On June 5th it was coupled to 25048 to work the 07.40 Euston - Aberystwyth forward from Wolverhampton. The return journey to Shrewsbury was marred by the failure of 25048 before the climb to Talerddig. The following weekend (12th) it was joined with 25154 to work the 10.10 Euston - Aberystwyth from Shrewsbury returning with the 16.05 to Shrewsbury. The next day the same pair worked the 08.45 Birmingham New Street - Aberystwyth forward from Shrewsbury and covering a round trip Aberystwyth - Machynlleth service before heading back east with the 18.15 Aberystwyth - Euston as far as Wolverhampton. Photograph courtesy Mr B. 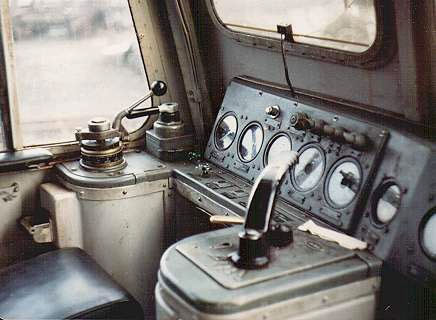 The driver's desk and controls of 25200. 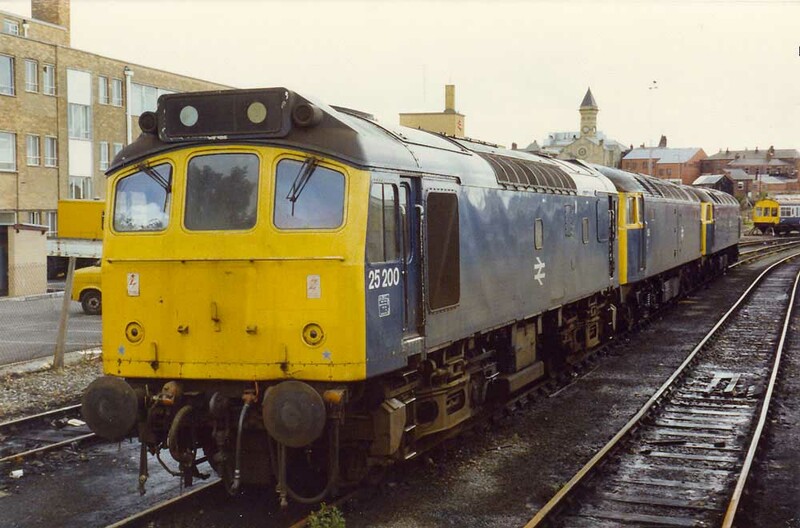 25200 was at Derby Works from September 1982 to January 1983 for collision repairs. 25200 was noted passing through Luton light engine on April 14th. It was railtour duty for 25200 & 25086 on a damp May 14th with the 'Amlwch Pioneer' which had started from Euston and utilised the Class 25s between Rock Ferry & Wolverhampton. 25200 was noted through Leighton with 6M86 cement empties for Tring having run round at Bletchley en route from Kings Cross goods on July 25th. On August 14th 25200 & 25193 were busy between Rugby & Bletchley assisting three services around engineering work which required the power to be off. It was another visit to the Cambrian lines on September 3rd with 25200 & 25212 working the 10.10 Euston - Aberystwyth forward from Birmingham New Street. They returned eastward with 17.15 Aberystwyth - Manchester Piccadilly as far as Crewe, the train being extended due to late running. On December 20th power was off on the WCML in the Watford area, 25200 was used to assist the 22.10 Euston - Fort William service to Rugby (?). During March 25200 was at Derby Works for N6 repairs. On March 29th 25200 worked a five coach York - Derby empty coaching stock movement. 25200 was stabled at Warrington Arpley on April 21st. May 19th found 25200 visiting Parkeston on the early morning passenger from Wolverhampton, having replaced a failed Class 31 at Nuneaton, it returned west on the booked Harwich - Peterborough passenger service. Preston continued to see Class 25s on passenger duty, the 16.20 Glasgow to Liverpool on Fridays produced 25200 on May 18th. On June 22nd 25200 assisted a late evening Altrincham - Crewe electric multiple unit service from Sandbach to Crewe, due to the power being off. 25200 was noted shunting at Carnforth North sidings on July 17th. The failure of 40143 on August 20th's 09.13 Carnforth - Liverpool allowed 25200 to fill in. 25200 & 31102 were noted light engines passing Rugby on September 22nd. 25200 & 25057 were noted at Cwmbran with a very lengthy 6S78 18.10 Severn Tunnel - Mossend freight on September 26th. The failure of a diesel multiple unit on November 19th's 07.45 Blackpool North - Manchester Victoria was covered by 25200. Three days later whilst in charge of the morning Bangor - Bletchley vans 25200 became a total failure on the Northampton line south of Rugby. A following diverted Liverpool – Euston service pushed the failure to Watford Lodge loop, rescue eventually coming in the shape of 31178. Two further rescues occurred during December, on 15th the 08.40 Euston - Wolverhampton with 81002 failed at Leighton Buzzard, 25200 worked the train forward to Bletchley. And on December 21st a Class 47 expired on the 20.00 Cardiff - Crewe at Craven Arms, 25200 & 25145 took the service forward to Crewe. When an afternoon Preston - Barrow diesel multiple unit failed before departure on January 25th 25200 was ready to work the service to Barrow. 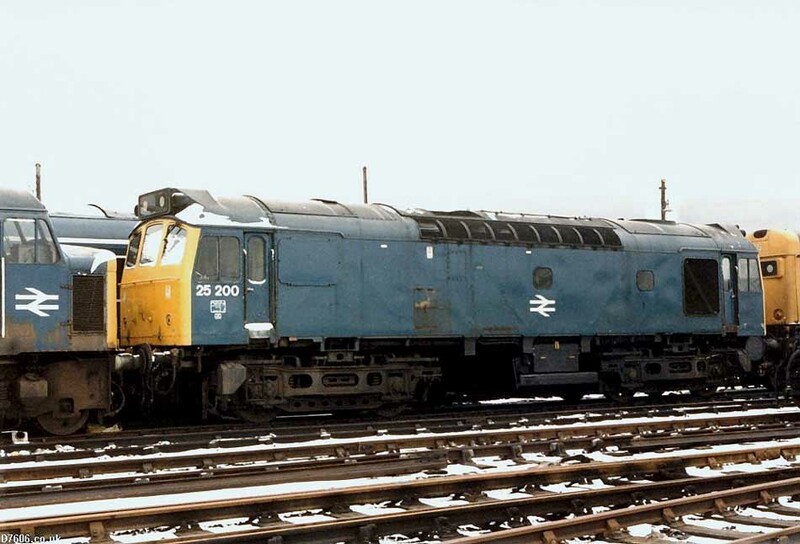 25200 was stabled at Preston on January 30th (three piece miniature snow plough equipped). On February 7th 25200 was noted arriving at Crewe with a Class 304 electric multiple unit. On March 9th 25200 assisted an afternoon Hadfield - Manchester Piccadilly service forward from Guide Bridge. On March 21st 25196 & 25200 set out with the Severn Tunnel Junction - Mossend freight. 25200 (with snowploughs) was noted northbound at Saltley hauling a rake of coal wagons on April 12th. 25200 & 25191 were noted on May 19th northbound at Preston with the 6S51 06.50 Stanlow Refinery - Bishopbriggs Oil Terminal bogie tankers. 25200 (with snowploughs) & 25051 worked the 6H33 12.08 Carterhouse Junction - Earles Sidings cement empties on May 29th. Early morning travellers on June 2nd had the delights of 25200 on the 04.31 Crewe - Preston relief. Photograph courtesy Paul Bettany. 25200 at Crewe on July 14th 1985. 25213 & 25200 were noted departing Tyne Yard for Carlisle on July 11th. 25276 & 25200 (no snowploughs) started out a Severn Tunnel Junction to Mossend Speedlink on July 24th. On July 30th 25095 & 25200 were stabled in the goods loop at Stalybridge, with a westbound (empties) bogie oil tanker train. 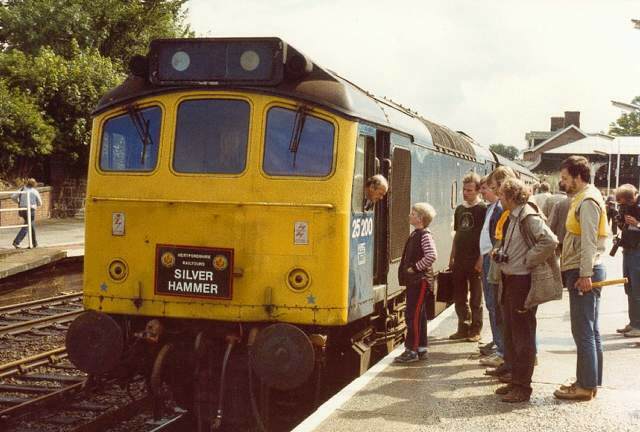 On August 3rd 1985 Hertfordshire Railtours ran Maxwell's Silver Hammer railtour out of Euston to the Maxwelltown/Dumfries area. From Euston to Wigan North Western 85035 was in charge, at Wigan 20104 & 20090 took over, running via Clitheroe and the S&C to Carlisle. Here 25286 & 25200 were waiting to work to Dumfries, where the train was Top'N'Tailed to Maxwelltown by the Class 25s. Then it was back to Carlisle for the same Class 20's to return to Wigan via the WCML, with 85035 doing the honours back to Euston. Two days later (August 5th) 25200 assisted the 13.45 Lancaster - Carlisle diesel multiple unit forward from Barrow after it got into difficulties. Photograph courtesy Nick Ross. 25200 & 25286 on railtour duty at Dumfries on August 3rd 1985. When 47453 failed at Chester on September 3rd's 10.10 Holyhead - Euston 25200 & 25176 worked the train forward to Crewe. A regular evening Newcastle – Carlisle – Euston empty coaching stock working frequently used Class 25s, 25200 so noted on September 21st. 25200 was noted at Severn Tunnel Junction on October 23rd. The TOP's report indicated 25200 was stopped for the final time on October 31st 1985 with 39 hours due before its next 'A' exam, but was overdue its next 'E' exam by 1,736 hours (about two months). It was moved to Derby Works being noted there during December. Whilst in the Works an investigation revealed extensive power unit damage, making repairs uneconomic and withdrawal occurred in February. However 25200 would surrender its bogies to 25190 which was possibly the last working example to visit Derby Works. Photograph courtesy Ian Hammond 25200 at Derby Locomotive Works on February 15th 1986, its been withdrawn for less than a week. Derby Works finally lost its connection with the Type 2s (after almost 30 years) when 25200 was towed away, with other locomotives to Vic Berry’s on the morning of January 19th. The convoy consisted of 25200, 40075, 45057, 45117, leaving Derby on January 19th and reaching Vic Berry's Yard on January 27th, - 47199 was used to haul the dead locomotives. By February 1987 25200 had been broken up. Page added May 5th 2006.